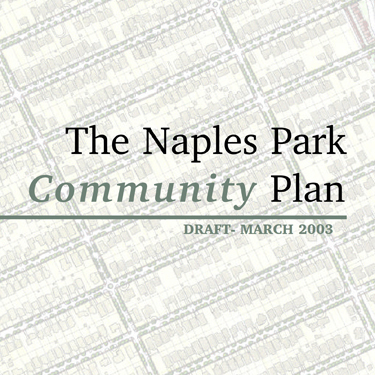 This page provides information about a community plan that had been proposed for Naples Park, located in northern Collier County, Florida. This plan was completed in 2003 but was not adopted by Collier County. GREAT STREETS... Naples Park has three north-south streets (6th, 7th & 8th) and two east-west avenues (91st and 111th) that serve as major traffic, bicyclist, and pedestrian corridors for the entire community and beyond. Collier County should improve these streets as a clear demonstration of how two-lane streets can serve important traffic purposes while still being neighborhood amenities. Although each of these streets has seen improvements through the years, they have not been designed to fully balance their diverse purposes. 8½ STREET... Recent road improvements to US 41 have altered traffic circulation in Naples Park. Collier County could dramatically improve traffic circulation by allowing the private sector to create a new north-south business access street just behind the businesses along US 41. This new street would also provide a new kind of address in Naples Park, where live/work combinations, mixed dwelling types, and pedestrian-oriented commerce would be welcome as a transition between the motorist-oriented business activity facing US 41 and the sensitive single-family residential areas to the west. An incentive-based voluntary approach is proposed in this plan that could, over time and block by block, create 8½ Street. GREAT AVENUES... Naples Park continues to suffer chronic flooding as a result of a lack of planning by the original developers. The first part of the retrofit, the primary drainage channels, were installed underground five years ago; however, the roadside ditches along the avenues are not fully connected to the primary drainage system. If this connection can be made via underground piping rather than wider and deeper ditches, Naples Park residents can also have sidewalks, street trees, and street lights above the pipes, enhancing the beauty and walkability of their neighborhood. Because the potential solutions are expensive, this plan proposes that Naples Park property owners decide for themselves whether to proceed, what level of improvements they prefer, and what pace is most desirable. COMMUNITY SQUARES... Despite its name, Naples Park has practically no parks. Larger community and regional parks are available nearby, but there are no proper neighborhood parks or community squares that are accessible on foot or by bicycle and no public open spaces that are freely available for community gatherings. Because Naples Park residents are adamant that the government power of eminent domain not be used in their community, voluntary approaches are proposed in this plan that might result over time in one or more community squares at strategic locations within Naples Park. REVITALIZE BUSINESS 41... Businesses along US 41 seek customers from all who pass by on the highway. Yet they are hardly isolated from Naples Park; businesses can provide convenient shopping and employment for local residents, and they can also degrade the adjoining neighborhood. Whether the businesses help or harm Naples Park is determined by how they are placed on their sites and how they are operated and maintained. This plan recommends a series of actions that can simultaneously improve the business climate and better integrate the businesses with Naples Park, for the betterment of both. CODE ENFORCEMENT/EDUCATION STEP-UP... Without reasonable code enforcement, neighborhoods decline. Counties rarely put the same emphasis on code enforcement as cities, but Collier County has been improving its code enforcement procedures and welcomes improved cooperation with local residents. A second shift of code investigators is now on duty every afternoon and evening; all complaints are given a case number that can be used to follow how the complaint is being handled; and complaints can be filed on the Internet. Additional steps are recommended in this plan to further improve the enforcement of codes in Naples Park. NEW STANDARDS... It has been impossible for Collier County to adopt zoning regulations tailored to Naples Park because its zoning district (RMF-6) is shared by other neighborhoods throughout the county. This can be rectified either by adopting a new zoning district just for Naples Park or by creating a Naples Park "zoning overlay" with special rules that supersede the RMF-6 rules where needed. This plan suggests careful consideration of new rules for Naples Park that encourage front porches by allowing them to extend into front yards, modify the current height and setback regulations, control excessive parking in front yards, and improve the character of replacement homes on existing lots. PROMOTING AFFORDABILITY / DIVERSITY... Economic and demographic changes are beginning to transform Naples Park by replacing the traditional smaller homes on 50-foot lots with much larger, more expensive homes. Although economic changes aren't easily managed, carefully written regulations can allow the introduction of some dwelling units such as townhouses on smaller lots that will allow retirees and new households to remain in Naples Park rather than being forced to move north into Lee County to find housing that suits their needs at costs they can afford. The Naples Park MSTBU should be expanded to help finance a greater range of public improvements, with property owners allowed to voice their approval or disapproval of specific improvements on their blocks through a straw ballot. Collier County should consider establishing a program of matching funds for redevelopment purposes. Three alternatives are available; a community redevelopment area (CRA) is the most promising. Existing county, state, and federal grants should be sought for all eligible improvements. The Collier County Commission authorized the preparation of a Naples Park Community Plan in 2002 to carry out the principles of "Toward Better Places," the Community Character Plan for Collier County. This plan was completed in 2003 but was not adopted by Collier County.